There's optimism over the new comprehensively overhauled EcoSport. The changes are genuinely impressive. But has Ford done enough to compete in this competitive segment? How many goes do you have at something before giving up? It would be easy to assume that Ford had quietly given up on the EcoSport, the ‘World Car’ that was bestowed upon the UK back in 2014. Initial sales were low, so a hurried facelift came to market just a year or so later where the boot-mounted spare wheel was dropped, the interior quality was boosted and the suspension tweaked to European tastes. It still wasn’t exactly a favourite for the UK though, with sales of the Vauxhall Mokka dwarfing those at Ford. Many assumed the EcoSport might be left to disappear, silently being dropped from the range. Instead Ford is having another crack at giving this B-segment SUV some traction with a pretty comprehensive overhaul. 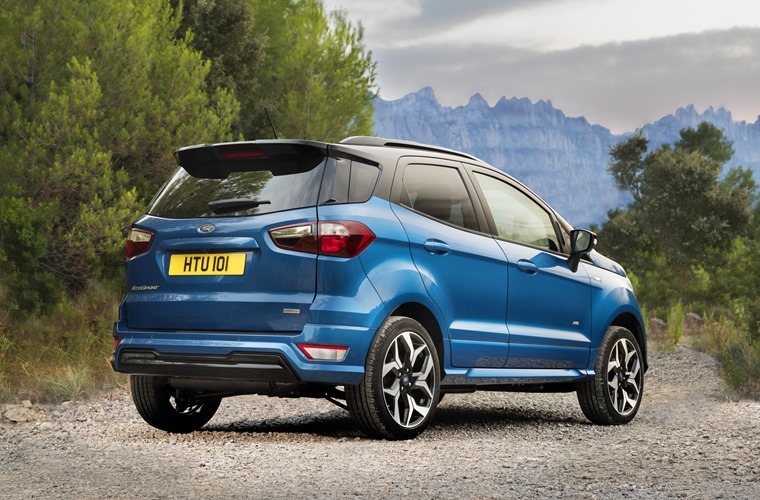 Unlike most facelifts, the changes to the exterior are visible and plentiful; a new grille, lights, bumper and even bonnet give the front end a modern, Ford-family look, while new bumpers and lights at the rear tidy up the tail. A selection of bold colours are available, and there’s the flavour-of-the-month option of a contrasting roof, while new sporty looking wheels balance the style. 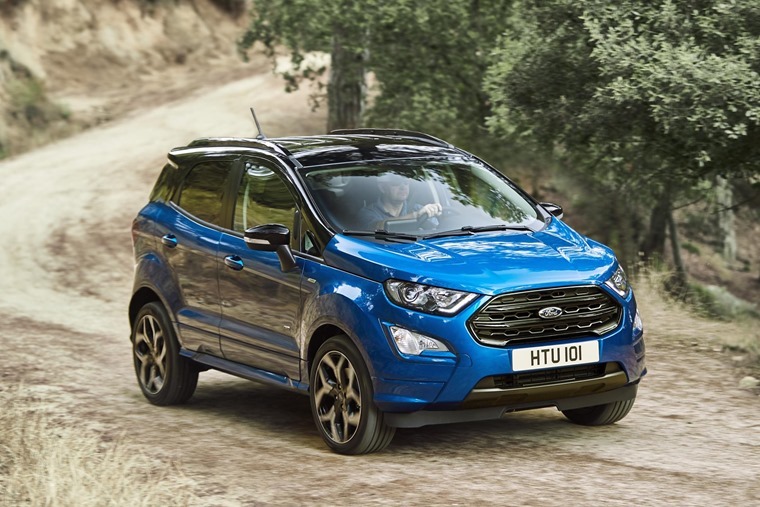 It’s a remarkable transformation, leaving the Ecosport looking fresh and contemporary, although still awkwardly tall and narrow. Step inside and the transformation continues. Where there was once a centre stack festooned with buttons modelled on an old Nokia phone (who’d have thought that would date badly?) now sits a dashboard that looks to have been lifted directly out of the new Fiesta. That’s a huge step forward, with a large infotainment screen dominating proceedings and an instrument binnacle that no longer hurts to look at. It’s all grown up, with better quality materials, a more cohesive design, and construction quality that is on a par with its rivals. It does all the B-SUV stuff it needs to do to a perfectly acceptable level. There’s enough room for adults up front, and two adults will fit in the rear. Three adults would be considered cruel and unusual punishment, but kids won’t complain quite so much. The boot is 346 litres, which is about the same as the boot on a Nissan Juke, but it’s accessed by a tailgate that swings out to the side rather thank lifts upwards. That could catch you out if somebody has parked quite close to the rear of the car. 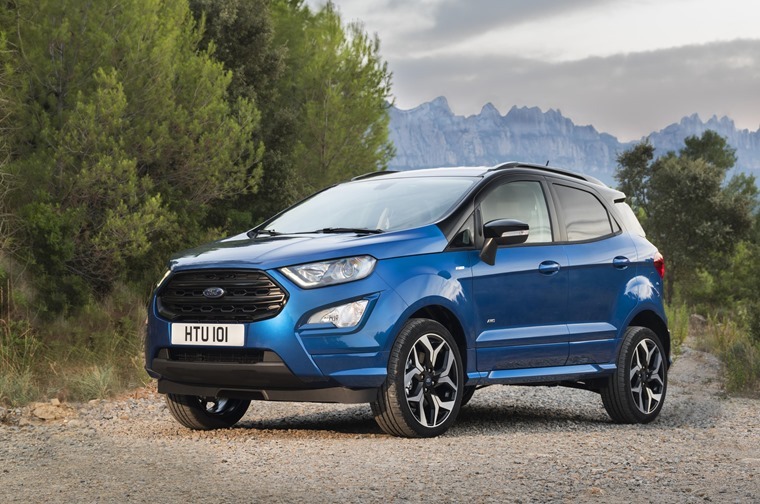 The changes to the EcoSport are enough that it's no longer a car to dawdle cross country in. Ford has boosted the equipment levels too, so there’s air conditioning, height adjustable driver's seat and Ford's Sync 3 infotainment system across the entire range, while this ST-Line model gets the delights of 17in alloy wheels, sports suspension, an ST-styled bodykit, gloss black exterior trim and a large rear spoiler.. There's a 1.5-litre diesel engine under the bonnet, providing just 99bhp, which leads to a 0-62mph time of 14 seconds, but that doesn't tell the whole story. While it's slow off the line, making urban driving a bit tiresome, it catches up once rolling and leaves you more confident in pulling onto motorways or tackling an overtaking move. There's the tiny 1.0-litre petrol available, in different states of tune, and that's better suited to the city. There's the promise of 68.8mpg from the diesel, which could save a chunk of money on fuel, but there's quite a premium up front for the benefit. Company car drivers will also face a BIK rate of 23%, rising by another 3% in April. In fairness, Ford don't expect many company user-choosers to look too long at the EcoSport. There's optimism all over the EcoSport. The changes made over the existing model are genuinely impressive. 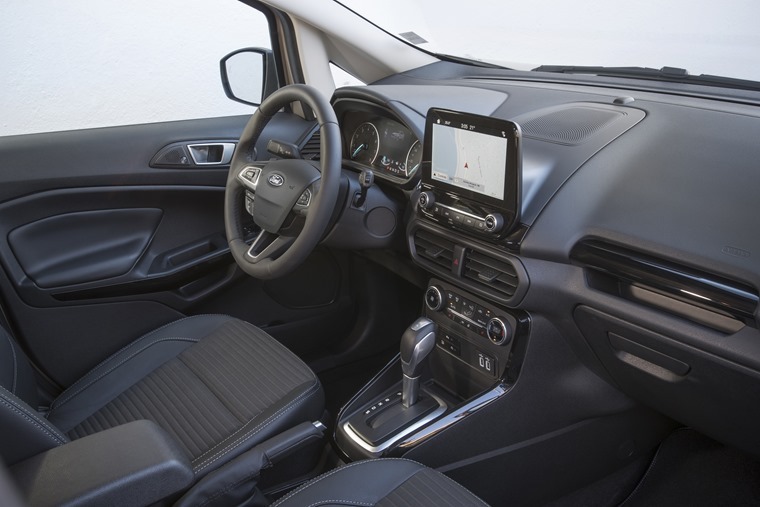 None of the models are exactly paragons of handling, with nothing here to worry Mazda or Seat, but the changes to the EcoSport are enough that it's no longer a car to dawdle cross country in. Suspension is soft enough to smooth out most surfaces, and there's enough grip to make it round most corners, but it'll never engage you in the way that a Mazda CX-3 might. There's plenty of body roll too, affecting your confidence a little. However, while it at least works effectively, if not impressively, that's with one caveat; it's only true in the four-wheel drive model. The four wheel drive variants get a less sophisticated rear suspension… and you can tell as what was comfortable soon becomes unacceptable. And, while we're on four-wheel drive, don't be fooled into thinking this is a proper off-roader; a damp field at the county fair might be passable, but a winter jaunt across the Cairngorms would be optimistic. There's optimism all over the EcoSport. The changes made over the existing model are genuinely impressive. 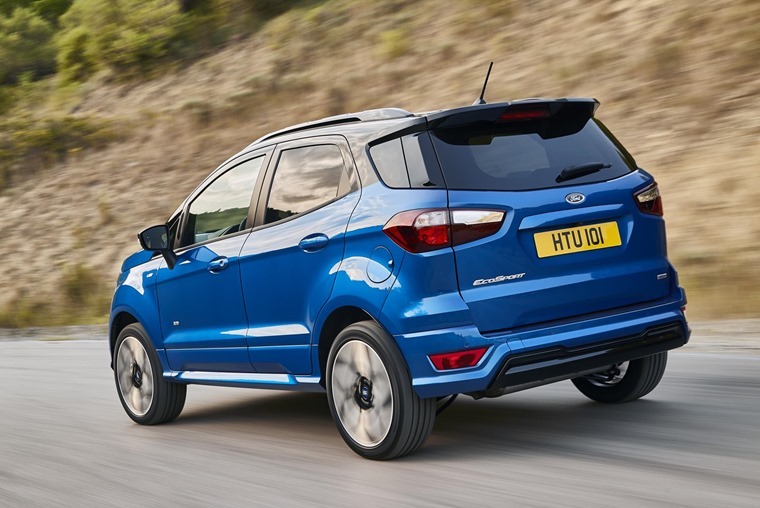 It's not quite a case of third time's a charm though as, while the EcoSport is now a far more complete car than it's ever been, it still lags behind most of its rivals. If we did start ratings, it would be one star behind a Renault Captur, and two behind a Mazda CX-3, Seat Arona or Hyundai Kona. For the right price, and for the right customer, it'll be acceptable, but others are better.